Should the Home Office ban Franklin Graham from the UK? In my Facebook feed this morning was a post from a respected Christian friend and fellow community activist, sharing a Twitter post from of all people Jeremy Vine. I make mention of the Home Office in the title because of my disgust in the past that it had banned people (the good guys) coming to the UK who had criticized Islam and let in Muslim hate preachers (the bad guys) in order to appease Muslims and out of misguided political correctness. Besides being an upholder of peoples’ right to speak as they find (providing it does not incite hate and promote violence) I recoil at the Home Office making these judgments because I don’t have the confidence their decision will be righteous. As for Franklin Graham, I think he is a great guy, and I would like to see him come. That doesn’t make him perfect or I always agree with them. Some of his rabid, right rhetoric is too much for even me. I quite get it that while he says he does not endorse politicians and political ideologies, he has repeatedly shown himself to be on the side of President Trump and his policies and has often been opposed by the anti-Trump brigade (which I suspect is well represented among the “many people detest” mentioned by my friend). I like Graham because he has not only spoken on issues I care about and offered views that not only do I agree with but needs to be said, but has courted unpopularity including among fellow Christians when doing so. More importantly, he was right to do so! Blackpool could be a million miles away from where I live (actually it is 272 miles) given my knowledge of what happens there. Other than what my friend has told me and the little I have read, I know too little about the Christian set up there or the background and objectives of the “Festival of Hope” where Graham is the main speaker. It did make me think though what my position would be if I had influence as to whether or not to invite Graham or rescind the invite. I do so mindful that an important element my last two blog articles was Christian unity. Here we have yet a further example where Christians are disunited and is regrettable and especially now the likes of Jeremy Vine has waded into the controversy. While Graham comes with baggage in a way his famous father did not, I favour him coming and while I take no delight in offending my brothers who think otherwise. I get it that good Christians will be offended and there are other less controversial preachers to do this gig but I feel I must support the invite as much because I recoil from the hatred and ignorance I see around me and it is hope what we desperately need at this time. 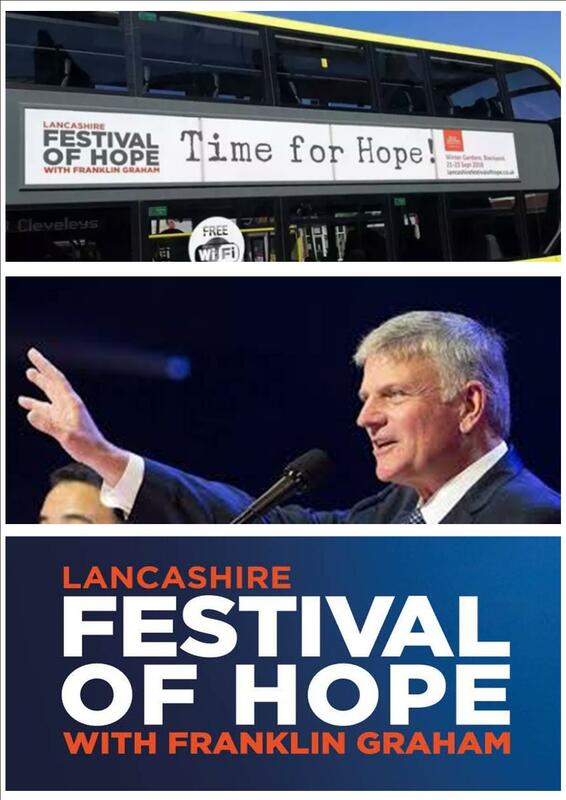 I hope the mission does not become political and pray Graham will preach the old fashioned Gospel, the message of hope, and notwithstanding the qualms of this disparate band of opposers, the people of Lancashire will be blessed. I think he is right in what he says about some of the Muslims, but now and then one must not say what is right. Is that right?